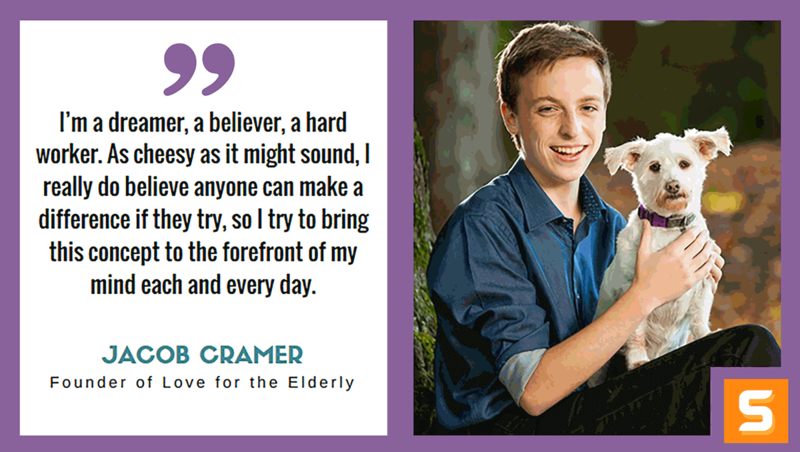 Jacob Cramer, founder of Love for the Elderly, is a pretty amazing 16-year-old changemaker from Cleveland, OH. He's a critically-acclaimed public speaker, and his message of advocacy for changing the way we view our elders and breaking age barriers has been broadcasted throughout the world since he began his philanthropic journey in 2013. In this interview, Jacob shares his awesome journey as a young social entrepreneur who's onto something big to change the world. He converts his passion to bring smiles to the elderly into a nonprofit project and influencing others from around the globe to do the same. He is a busy high school junior but still has time for the other important aspects of his life, education and career. So, Jacob what’s your favorite part of being an entrepreneur and why? I love having the opportunity to inspire people, yet since I’ve always been a shy person, the first steps in public speaking were tough for me. Being able to get the word out there about what I’m doing and my nonprofit has shown me a road of confidence and courage that is unparalleled. How did you get started? Was there an ‘aha moment’? Many people don’t know this about me, but I actually had another journey into the world of entrepreneurship before “Love for the Elderly” took off. I started a business called “Poetic Possibilities,” which was essentially a site for poetry-aficionados like me to meet, enter contests, and become inspired. However, I realized this wasn’t something I was truly passionate about. I wanted to do something not to make money, but to give back—so I founded Love for the Elderly in December of 2013 with the goal of bringing some love to lonely seniors. My true ‘aha moment’ came when I was featured on The Huffington Post; I realized I might be onto something big. How did Love for the Elderly get off the ground? Did you bootstrap it? To get publicity, I initially tried many different things. Reaching out to podcasts, infinitesimal blogs and e-newspapers, my local press, etc. Yet what I found to be most effective was harnessing the pre-existing “kindness community” within social media. I made use of the resources I had, and by myself, I managed to turn Love for the Elderly from a small project into a global nonprofit organization. What roadblocks did you face initially and how did you overcome them? Funding was big problem for me, as without any corporate sponsors or partners, I lacked the financial resources necessary to sustain a nonprofit. So, I began reaching out to various small businesses and applying for grants, and after seeing much success with this, I’ve been enabled to expand my nonprofit and broaden my horizons. What’s been your most epic moment so far as an entrepreneur? Seeing the impact my nonprofit has on the lives of the elderly is a really worthwhile experience—it makes me so happy to know that we’ve impacted 15,000 seniors’ lives and counting! What makes Love for the Elderly unique and how did you find your niche? There’s no other nonprofit like LFTE. We strive to bring love and joy to seniors, and no other organization does this like we do… through simple handwritten letters, pen-palling, and “SunshineBoxes!” I’m doing something I’m passionate about, which is why LFTE has had so much success. If you’re doing something you love and care about, you’ll go far! This is a big one, how do you balance your personal life? It’s tough to balance my time, but I do my best to make sure all aspects of my life get the attention they deserve. School – being a junior and preparing for college – is a huge priority, and I also try to set time aside for my social life, but the key thing is that I make productive use of my free time by doing work for LFTE, whereas most kids my age might be procrastinating. What’s your greatest fear as a brand owner? Losing my passion. It scares me that as I delve further into the corporate side of things and away from the actual impact, I’ll lose sight of what I care about most: bringing love to the elderly. This hasn’t happened yet, and hopefully it never will [we really hope so too Jacob]! Can you explain how your personal mindset influences your life and nonprofit? I’m a dreamer, a believer, a hard worker. As cheesy as it might sound, I really do believe anyone can make a difference if they try, so I try to bring this concept to the forefront of my mind each and every day. What are your top 3 bits of advice for starting a business in Ohio?